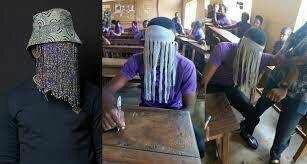 A 200l student of the department of Mass Communication, Chukwuemeka Odumegwu Ojukwu University, Anambra State, was sent out of the examination hall for deciding to dress like his role model, a popular Ghanian Journalist Anas Aremeyaw Anas. The Ghanaian investigative journalist is known for putting on a mask as an undercover journalist. So the student showed up for his exams dressed in a mask. His fellow student were amazed to see his appearance, but it was just for a short while. The shackles fell of his eyes when an invigilator walked him out of the hall. He initially refused to go out but was later dragged out by his fellow student who was upset that the exam was being delayed by his actions. However we can’t tell if the student was later allowed to sit for his exams or if he finally removed the mask.